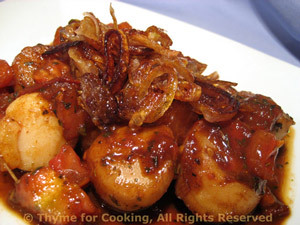 Seared Scallops with Browned Shallots, Thyme for Cooking easy gourmet dinner. To go with the scallops I made a simple Winter Pilaf, with mushrooms and walnuts. I often make Rice Pilaf in summer with fresh tomatoes and herbs. This is a winter version. 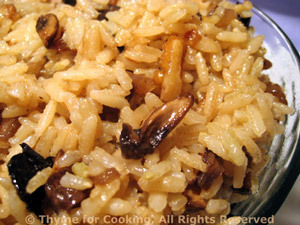 Use quick-cooking brown rice or substitute Basmati. Combine rice and stock in small saucepan. Cover and cook according to package instructions. Break walnuts into smaller pieces if needed. Heat oil in a medium skillet. Add shallots, mushrooms and walnuts and sauté until shallots are tender and it all starts to brown. Add olives and heat through. When rice is done add to skillet and stir well. Serve. Often, simple is best! The first time I tasted cauliflower (my mother never fixed it) I was convinced it tasted just like sweet corn. Plain, with butter, is still my favorite way to eat it. In same pan melt butter. 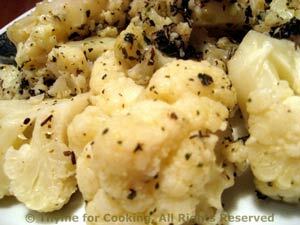 Pour over cauliflower and serve - adding salt & pepper if desired.